Many of us suffer under the illusion that only “born artists” are creative, and the rest of us are just ungifted. But it turns out, creativity, like reading, writing, or public speaking, is a basic skill that anyone can learn. No, we are not all gifted to excel, but we can all learn and enjoy the basic skills of creativity. 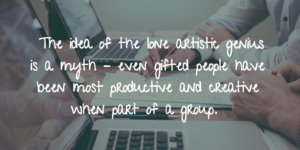 But even the idea of the lone artistic genius is a myth – even gifted people have been most productive and creative when part of a group. Hence Keith Sawyer’s new book Group Genius: The Creative Power of Collaboration. Not only does Sawyer dispense with the idea of solo creativity, he reminds us that creativity can be applied to any of our endeavors – not just art, but sport, engineering, and business in general. Sawyer was recently interviewed on the Portfolio Life Podcast, it’s worth a listen. 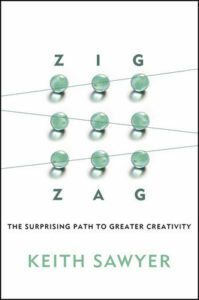 Here’s my outline of his 8 Steps to Creativity, as discussed in his previous book, ZigZag (2013). This model is really geared towards creativity in business and creating products and services, but it can also be applied to your writing! You should create and ask good questions to try to define what you’re trying to do or the problem you’re trying to solve. You should master all of the current information or skill sets that are available up to this point. Consciously observe what is going on in your environment and in the marketplace. You will be surprised at what you have missed if you make an effort to look. Taking the time away from your project to allow your mind to synthesize and come up with new and better ideas is important. Combine two or more ideas into a novel solution. Ideas that come from different disciplines can often be groundbreaking. Choose one idea and test it. Try to make improvements to it. Turn it upside down and challenge it. Are there better ideas? Bigger or smaller scope? Think about how you can iterate this idea over time. Get your ideas out into the world before they are perfect. Even if it’s just in the idea stage, get it out of your head and develop a prototype so you can have interaction with it external to yourself, and perhaps even talk about and share it with others.